Grand Hotel Varna Resort & Casino is a new resort consisting of Grand Hotel Varna (5 stars) and 3 satellite hotels Dolphin (4 stars), Lebed (4 stars), Rubin (4 stars), as well as few other hotels, among them is Rusalka (3 stars, recently re-constructed). This new resort was a part of St.St. Constantine and Elena resort in the past. Now Grand Hotel Varna Resort & Casino is a separated resorts offering luxury hotels and first class services. 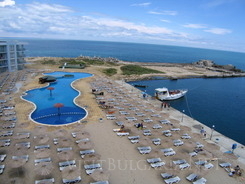 The resort is located on 17 North of Varna and only few kilometers South from Golden Sands and Albena.